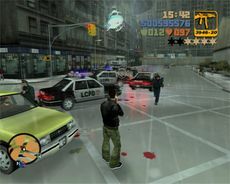 The Third-Person View in Grand Theft Auto III, the first game in 3-D of the saga. A Third-Person View (3rd Person) is a camera angle which shows the player's body from behind, instead of looking as if through their eyes. This is in contrast to a First-Person View where the camera only sees the players arms and weapon. Both views usually contain a HUD. A 3rd-person view is available in all 3D GTA games - the GTA III Era and GTA IV Era. This excludes the top-down games in the GTA 1 Era, Grand Theft Auto 2, Grand Theft Auto Advance and Grand Theft Auto: Chinatown Wars. GTA Chinatown Wars may have a more early style of game play, but it has a fully rotatable camera which is not present in any other Grand Theft Auto game. Top-Down or 2-D view in Grand Theft Auto. 2-D view in Grand Theft Auto 2, GTA unlike 1, this sample type graphics with a 3D style, only with top-down view. The graphics 3-D of GTA IV, with a style much different that of GTA III Era Games. The graphics of GTA Chinatown Wars, style 3D yet 2D. This page was last modified on 23 August 2012, at 21:17.